India and Indonesia will develop a naval port in Sabang, a strategic location on the tip of Sumatra island and at the entrance of the vital Malacca Straits. 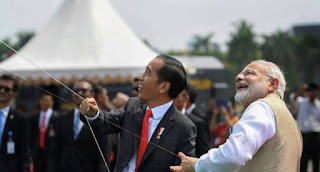 The move, which comes at a time when China is expanding its maritime footprint in the region, was the most significant decision among a series of other pacts the two sides signed after talks between PM Narendra Modi and President Joko Widodo during the PM’s first visit to Indonesia. The two nations also agreed to step up defence and maritime cooperation, with both countries agreeing to align their national maritime policies — India’s Indo-Pacific policy with Indonesia’s policy of ‘global maritime fulcrum’. Modi announced a 30-day free visa for Indonesian citizens and invited the diaspora to travel to their country of origin to experience the ‘New India’. “Many of you may never have been to India. I invite you all to come to India for the Kumbh Mela in Prayag next year,” Modi said. Both countries are finding convergence on the maritime front, largely due to fears of China’s expansionism. The joint statement also said they would negotiate the resolution of delimitation of maritime boundaries, which they said “should be based on the principles of international law including the 1982 UN Convention on the Law of the Sea.” China has encroached on Indonesia’s exclusive economic zone with its ‘nine-dash-line’, to the extent that Indonesia has now renamed its sea the Natuna Sea.